Macau Protestant Chapel, more commonly known as Morrison Chapel, (Camoes Square, near Camoes Gardens) has a history of approximately two-hundred years, although the present structure was not built until 1922. The earliest mention of a Protestant “chapel” no doubt referred to a room at the offices of the British East India Company, (E.I.C.) The traders of the E.I.C. were actively engaged in the China trade from the late eighteenth century until 1834, when the Company’s charter was not renewed. The E.I.C. charter required that chaplains be sent out from England to minister to the spiritual needs of the Company employees; these chaplains had to meet the approval of either the Archbishop of Canterbury or the Bishop of London. The Company not only provided chaplains; they required that employees regularly attend divine services! The charter also required that all baptisms, marriages and funerals be recorded and sent to London at regular intervals; these were sent from Macau as early as 1792. In 1821, when the land on which the present-day Chapel stands was purchased, it contained a tenement which the Company had been renting to house their printing press. The burial ground, now the Old Protestant Cemetery, was acquired at the same time. The E.I.C. had long been trying to purchase land for a burial ground, since burial for Protestants was not allowed within Macau’s city walls. And the sale of land to foreigners was forbidden by Portuguese law. But the death of Mary Morrison, wife of Dr. Robert Morrison, missionary and translator employed by the E.I.C., was the catalyst which brought about the transfer to the British of land for both the Chapel and the Old Protestant Cemetery. How this transfer suddenly took place, after years of failure on the part of the Company, is a bit of a mystery. Thanks to obscure records and destruction by white ants, it is impossible to know exactly what buildings have stood on the present Chapel site. There may have been a mortuary chapel for a time (perhaps a part of the original tenement); but it soon became a chapel for general purposes, evidenced by the marriage there in 1833 of Dr. Colledge and Caroline Shillaber. After 1834, when the E.I.C. lost its trade monopoly, responsibility for the administration of the Chapel and cemetery was taken by the British government; in 1870 this responsibility was transferred by Deed of Transfer to Trustees consisting of at least three Consuls or other high ranking representatives of at least two nations having Protestant members living in Macau. This board of trustees has usually had members from the United Kingdom, the United States of America, the Netherlands and Germany. 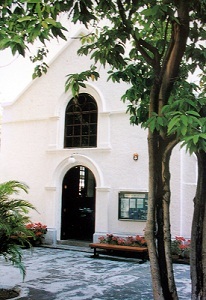 Although the Diocese of Victoria, Hong Kong, (and more recently the Province of the Sheng Kung Hui – the Anglican Church of HK and Macau) have faithfully supported the Chapel, it is owned and administered by the trustees. When the renovated building was dedicated in 1922, it was dedicated as a House of God, not as an Anglican church. The use of the Chapel and its state of repair have had their ups and downs over the years. A period of prosperity was experienced with the residence of Australian clergyman, the Reverend E. J. Barnett from 1898-1910. But by 1921, the Chapel required complete rebuilding, except for the original foundation. This renovation was promoted by Bishop Duppuy, who preached the sermon at the dedication ceremony which was recorded in The Hong Kong Daily Press of January 9, 1922. This newspaper account mentions Bishop Duppuy’s recalling two conditions for the construction of the Chapel: It had to be placed behind a high wall, hence not visible from the street; and it could have no church bell. During World War II the Chapel became a hub of activity as Macau’s neutrality attracted a flood of refugees. In charge during that critical period was Deaconess Florence Li Tim Oi from Hong Kong. 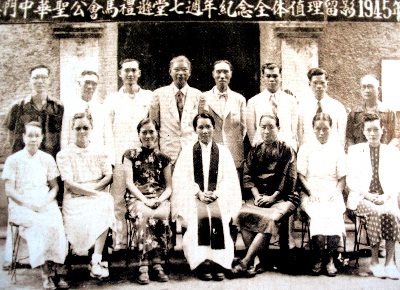 The circumstances and needs of the congregation led Bishop Hall to ordain Florence Li as an Anglican priest making her the first woman priest in the Anglican Communion. 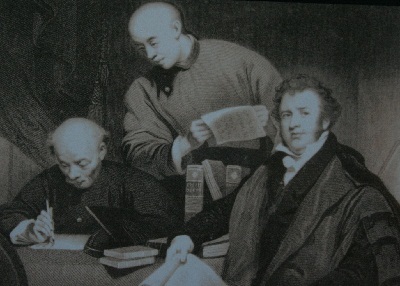 Dr Robert Morrison (1782-1834) was the first lay Protestant missionary in China. He was the first to translate and publish the Bible in Chinese and he produced the first Chinese dictionary. He also evangelized and baptized the first Chinese Protestant convert Mr Choi Kou.